Last night I hosted a Pre Shavuot evening for ladies. We heard an inspiring Shiur on the 'Spirituality of Shavuot' from Rebbetzin Chanee Shlomo of the Sinai Academy in Cape Town, a hands on talk by florist Manon from Okasie Flower Shop in Stellenbosch who showed creative ways of presenting flowers and I gave a Marble Cheesecake demo. We also explained the deeper significance behind the custom of eating dairy on Shavuot and decorating the Synagogue with flowers. A quick thought on the flowers: According to tradition G-d miraculously adorned Mount Sinai (situated in the desert) with beautiful flowers in celebration of the giving of the Torah. This reminds us that in life if one feels lost in a Spiritual wilderness, through the study and observance of the Torah one transforms that Spiritual emptiness into a blooming garden of flowers; bringing beauty, direction and meaning to one's life. Now while I don't usually eat dairy I don't mind observing the custom on Shavuot and having a bite - in general I go by the 80/20 rule, and this marvelous marble cheesecake recipe will have your Shavuot guests begging for a second portion! It is super easy and shouldn't take you more than 15 minutes to prepare. Mix all ingredients together and spray a Pyrex dish and press dough in the bottom and sides of the dish to form a base. Mix all ingredients together except for the cocoa and leave 1/3 of the batter in the bowl and add the rest into your dish. Add 1 tablespoon of cocoa to 1/3 cup of batter and pour along the centre of your dish. Ypu can use a knife or toothpick to design your marble cheese cake. Bake at 150 c for an hour or into cupcake holders for 45 minutes. Wishing you a meaningful and inspring Shavuot! 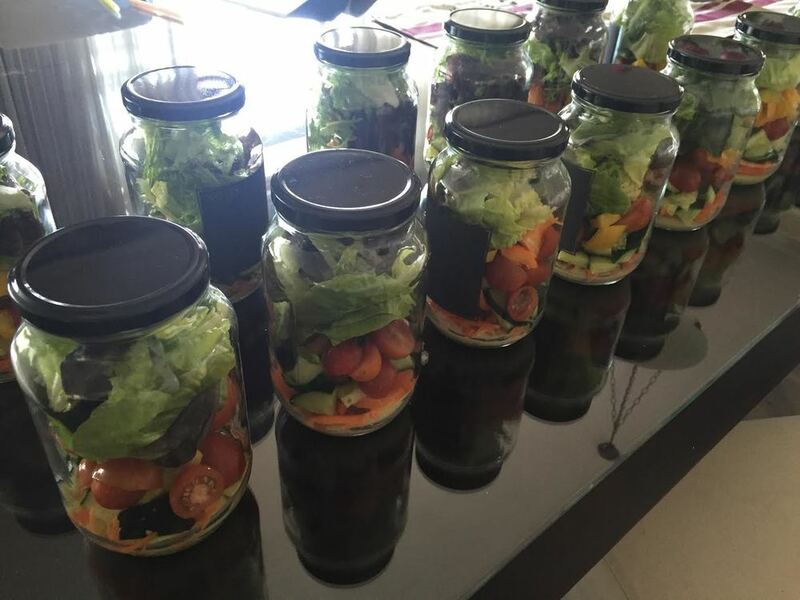 Salad in a Jar - Purim Gifts! I know its been a while but I wanted to share what i gave out on Purim to friends - it's called Mishloach Manot. 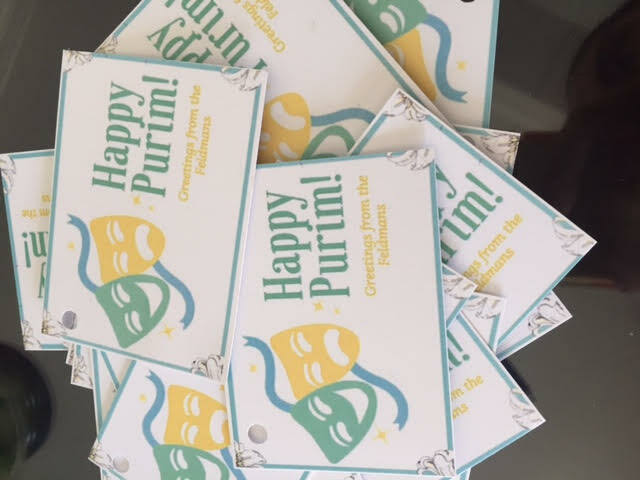 One of the mitzvahs of Purim is to give gifts of food to others - it's a very special tradition and it is beautiful how it brings the community together. 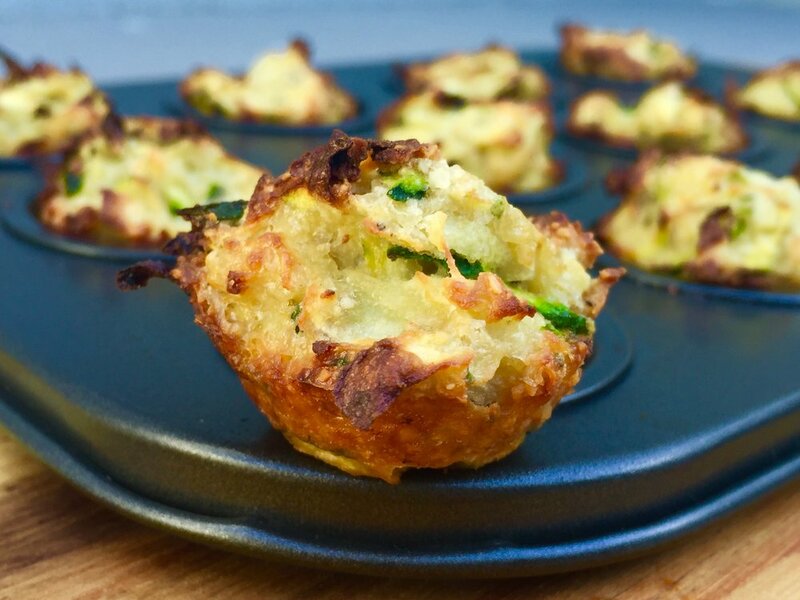 I find that Purim is usually an excuse for everyone to eat a whole bunch of sugar and junk and I really wanted to create a healthy option this year. I was at a store two days before Purim and with some inspiration from Pinterest this is what I did. The pictures are in the order of what I put in first - it is all pretty self explanatory. It turns out that they are also quite long lasting, I had an extra jar in my fridge and I ate it a week after I made it and it was still delicious and not soggy at all. The trick is to put either chickpeas, beans or hearts of palm on top of the dressing and then layer it with different colored vegetables. The dressing is below. All you need to do is put all the ingredients in a bowl and whizz it all up. You can use this dressing on any type of salad - I use it on a Vegetable Chip Salad as well where I have lettuce,roast butternut,veg chips and avocados. 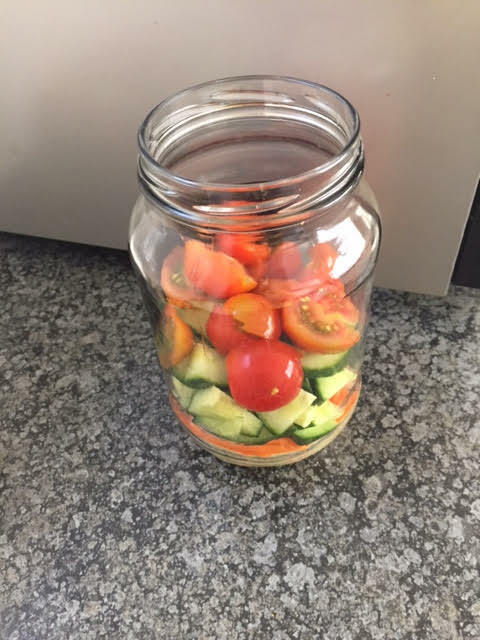 Tip: Prepare five jars at the beginning of the week and enjoy a healthy , ready made lunch at work. I've previously posted two videos that I made for Lose It's Kosher Meal Plan. This third video shows you how to make one of Israels most popular breakfast dishes, the Shakshuka.